This is an agreement, which may be signed with the Employee at the time of deputing him in United Kingdom for the purpose of accomplishing a critical project assigned to the Employer. This is an agreement, which may be signed with the Employee at the time of deputing him in United Kingdom for the purpose of accomplishing a critical project assigned to the Employer. During the period of deputation, the employee shall retain his employee status as such with the original employer who is located outside UK but would be paid by the Company, office where he is deputed for a particular period. During the period of deputation the employee is supposed to be governed by the UK employment laws not essentially covering his original employment but the term of his deputation in UK. For the purpose of safeguarding employer interests, it may be relevant to bind the employee for the sake of discouraging him/her from changing employment. 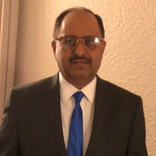 Moreover it may be relevant to clearly define his role, responsibilities, and remuneration etc besides other terms governing his employment during the period of deputation to UK through a detailed agreement. This document thus helps the employer. By defining default and its consequences, this document also helps the Employer put certain safeguards in place to save itself from facing an eventuality of the employee calling off midway i.e. during the period of his deputation thus causing severe losses to the reputation of the Employer before an International client and/or causing loss of business opportunity for the employer. 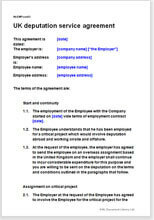 This document has to be used in addition to the Employment Contract that the Employer would have signed with the Employee. The Employer and the Employee may be located anywhere in the World, however, the deputation is supposed to be in United Kingdom.